Definitely one of the widest ranging categories and one than spans various different genres itself. I will, obviously focus on the more horror orientated creatures. As the title suggests, these films feature, in one way or another, to put it plainly, creatures. Some are beyond the realms of Earthly origin and others are simply "giant" versions of creatures we know. Some are more close to human than you might think but all have played a major role in the films we watch today. A more apt description in terms of the Horror genre would simply be Monster Movies! This genre covers more films than I could write about with less than 400 pages so I am going to give a brief history. Sorry to anyone who can think of films not mentioned but like I said. A Very large genre! 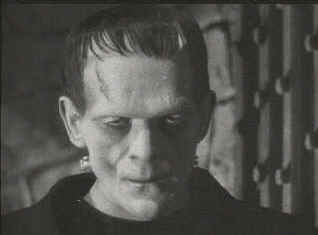 The early to mid 20th century saw the real ignition of Monster Movies with titles like Frankenstein, Dracula and The Lost World. We can immediately see how diverse the category is. With these three films alone we cover a scientist and his creation, based on the book by Mary Shelley, a Count trying to move to England from his native Transylvania, based on the book by Bram Stoker and a world inhabited by dinosaurs, based on the book by Arthur Conan Doyle. A little something for everyone and notably all follow a very similar trend. All these early monster movies are based on classic literary works. So I suppose, in retrospect all Monster movies that followed can trace some roots back to the early films laid out in black and white. Some more so than others but great credit must be given to the early pioneers of the fledgling art. Understandably for the movie producers of the day, once they found something that was selling they didn't stop there! Out rolled the prequels, sequels, spin-offs and re-tellings. Dracula alone has spawned dozens of sequels and re-makes, as well as hundreds of spin-offs including the "generic" vampire movies that have graced our screens. All exist as a result of this one story which was written in 1897. Now, I know in Part 1 I said I wasn't going to include Vampire films but I have had a slight change of heart and I am going to amend that statement. I am not going to mention any Vampire movies which I consider to be anything other than Horror. In other words, I am only going to include "Classic" Dracula pictures and this includes the Hammer Horror Films of the 60's and 70's. 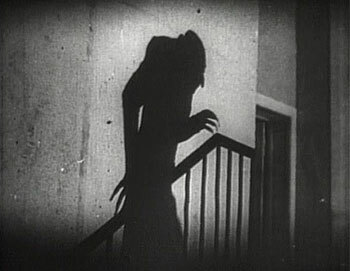 I suppose one of the most iconic images of Dracula can be found in the first Hollywood production to include the character. The 1931 Universal film, Dracula featuring Bela Lugosi. Anyone who has read earlier posts in my blog may remember my review for Plan 9 from Outer Space. Which I must admit, took on a bit of a Lugosi love-in rather than a simple review of the film. Some may argue with me but I think there are only really three actors who have made the part their own. Mr Lugosi here, Christopher Lee and although it may annoy a few people, Gary Oldman. 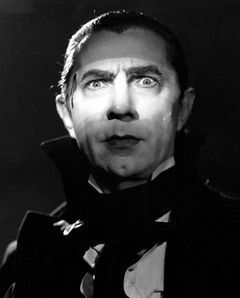 The great Bela Lugosi will always be remembered for the role, he was even laid to rest wearing the trademark cape. Cristopher Lee cut a very imposing figure in the Hammer Horror Films. First appearing as Count Dracula in 1958, Lee played the Count a year after his first Hammer appearance as Frankestein's Monster in The Curse of Frankenstein. He would go on to play Dracula several times in Hammer films. Though with varying succes but none matched the success of the '58 original. Many other actors have taken the role but with the possible exception of Max Schreck none have really stood out. Schreck portrayed Count Orlok in what is considered to be the very first adaptation of Bram Stoker's Dracula, Nosferatu, which was released in 1922. This silent German film did not secure the rights to the book so the names were changed and parts of the story tweaked but it isn't hard to find the similarities. However you look at it, Nosferatu is a creepy film and another which gives us an iconic image of cinema history and Vampire evolution. I have had this argument and you may not agree with me but I think Vampires are closer relatives to Zombies than any other Monster. The Zombie genre, however deserves its own little place, hence Horror Part 1 - Zombies. Right. Enough of the Vampires for now. We have so much more to discuss. As you move up through the Hollywood years we start to see a lot more weird and wonderful creatures. 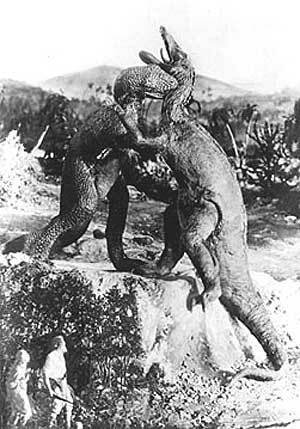 A Giant Ape in King Kong, a strange beast mutated by nuclear radiation in Godzilla and another which, much like the Vampire films have a long and successful history in cinema. The Lycanthorpe. A mythological shapeshifter known better by it's common tag... Werewolf! The first mainstream movie to feature this folklore was Werewolf of London, released in 1935. 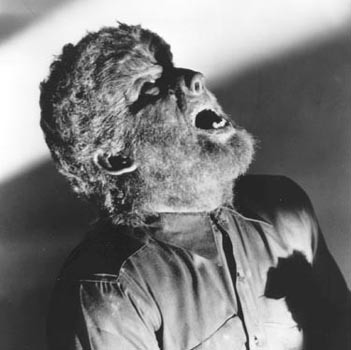 However, it wasn't until a few years later when Lon Chaney, Jr was transformed into The Wolf Man that, in movie terms, we were introduced to a more traditional Werewolf. 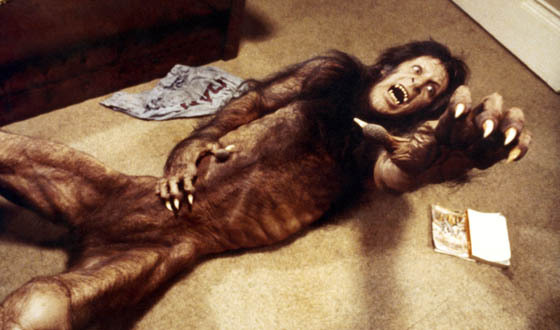 Later still in the evolution of the Lycan was An American Werewolf in London. Directed by John Landis, the film was monumental for its horrendously painful looking transformation scene. A scene which makes American Werewolf in London a timeless classic. Landis even directed Michael Jackson's epic music video, Thriller. The opening transformation of Michael Jackson into the Werewolf bears great similarities to that of his earlier film. Like Vampire films, Werewolf movies have been done with varying levels of competency. The Howling, based on a book of the same name was released in 1981 with mixed reviews but the franchise spanned 14 years (so far) and included 6 sequels, none of which should really be connected to the original! 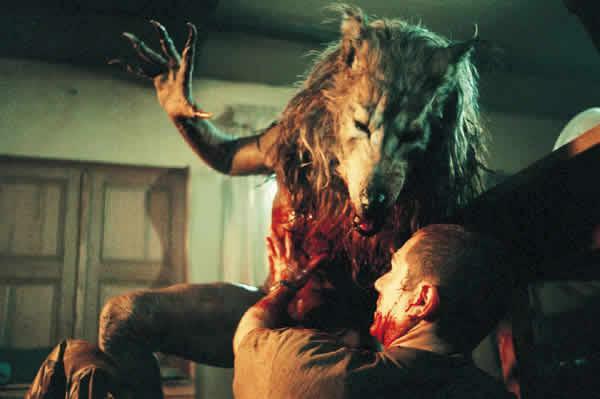 Dog Soldiers on the other hand is a fairly modest British number which above all else is just a fun film. Others have tried and we have even had the great legend of the war between Lycans and Vampires played out a few times in films like Underworld and Van Helsing. Neither of which are Horror films, I am merely illustrating the variants. Moving swiftly on from Werewolves, another to feature heavily in the Monster genre are Aliens. Now, I know what your thinking... This "small" piece on Monsters/Creature Features is starting to turn into a generic Horror category. Well, Yes. I suppose it is but all for good reason. While the Horror genre is vast, most movies can be sub-categorized into one of about four categories. Creature Features/Monsters (Which also includes Zombies), Slasher/Splatter, Psychological/Paranormal and Thriller. So without further ado, let me continue. Where were we? Ah yes, Aliens.. Alien films come in so many shapes and sizes. The more "Horror" angled Alien films however can be bundled into a nice little package. Without question, one of the scariest Aliens, if not one of the most horrifcally unthinkable images to ever grace my eyes... The Xenomorph. Quite simply one of the most elegant but deadly things to be plucked from the consciousness of a human brain! 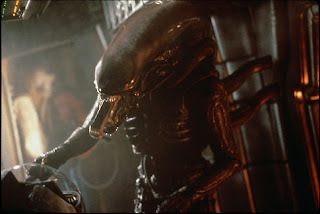 The Xenomorph is a race of aliens, totally predatory with no reasoning skills what-so-ever. To make matters worse, they bleed acid and have two mouths! Put quite simply, the stuff of nightmares. For me, Alien represents everything that is scary about the unknown and not to mention an unadultarated male fear of childbirth. John Hurt was the unfortunate soul who first harboured the embryo before its painful birth unto the deck of the Nostromo. Fear, panic and genuine shock lace the actors faces as we see the parasite in the flesh for the first time. Alien was followed by three very good sequels and two rather luke warm spin-offs, not to mention tons of books, games and fan made stuff! Ridley Scott certainly mastered the Sci-Fi genre but perhaps unwittingly with Alien, he gave us something else! He gave us a film that would invoke fear in the guts of many for generations to come. Alien, the two films actually share a startling resemblence to one another. Both feature a skeleton crew of people battling some kind of parasitic lifeform which ultimately turns into something unimaginable and horrific. In the case of The Thing, however, the form it takes on has a more morphed feel to it. Moving on we can find many, many more Horror/Sci-Fi films with weird and wonderful creatures or Aliens as the main antagonists. Another predator that must be mentioned is, of course, Predator. A humanoid alien with high intelligence and vastly superior technology and all it wants to do is hunt! I must say however, that while Predator is not traditionally a horror film, I am giving it special mention because of the appearance of the alien. Perhaps one could argue which is scarier, its beautifully crafted face mask or the hideously ugly reality beneath. Either way, the Predator has formed an integral part of the genre and along with his Xenomorph counterpart, has given us two spin-off films. Aliens vs Preadator and AVP Requiem. Neither are horror films but there is a connection. Anyway, Signs. An alien invasion movie that had me gripped all the way through. Perfect story telling and some very jumpy moments. Others however, have come from a more.... intrusive perspective. Species, is about an experimental hybrid. Human DNA crossed with Alien DNA and the result is a super hot seductress. She mainly appears in her wholly human form but occasionally we see a more other worldly look. After escaping from her creators, she hits the main populous with one thing on her mind; mate with a human and breed. While we are on the subject of Aliens, we must not overlook those fuzzy little fur balls... Critters. Although more Comedy than anything else, the Crites themselves serve as another example of Aliens in cinema. Clearly based massively on the back of the success of Gremlins, Critters was very succesful itself and spawned three sequels. On that logic, I must also mention Gremlins right about now. While Critters where clearly from outer space, Gremlins are more folklore than anything else. Lets bring it back a little bit closer to home. Whether its 65 million year old dinosaurs or giant crocodiles, Earth can provide just as much horror as the unknown expanses of space can. In 1975 a film was released which, with two simple music notes can send shivers down your spine and is instantly recognisable. Is it, of course, Jaws. Although the shark itself didn't look overly convincing in parts, its ghostly silhouette just feet below the surface of the water invokes a fear that can only really be felt when looking at something that could, really eat you! The best parts of the film follow an unhinged fisherman, a cop and a shark specialist isolated onboard the Orca in search of a killer Great White Shark. 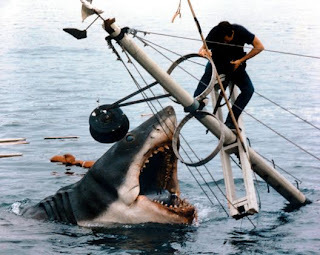 Safe to say that with the music and the fish itself, Jaws didn't only scare on its original release but has continued to do the deed up to this day. While many Shark films have tried, in my opinion Deep Blue Sea is the only one to come close but it still has a long way to go to beat the best. Deep Blue Sea mixes the shark element with the human element. A gene research experiment gone wrong creates three super fast, extra intelligent Mako Sharks. A modern day slasher with animals, the death scenes are much more elaborate and gory and the storyline is certainly one for movie fans my generation. 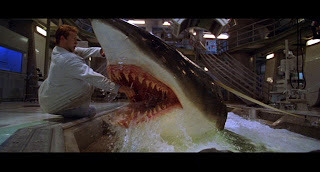 Other Shark films include the disastrous Shark Attack and Sharks in Venice. And sometimes the movie world dishes out it's own lab rat. Sharkman delivers two of the planets most deadly predators in one neat little body. The name says it all really. Sadly, another failure for the Shark department! When we talk about creatures that exist today that could kill us, we automatically assume two things, Sharks and Crocodiles. Lake Placid sees us in the lovely state of Maine chasing a 30 foot long crocodile. As funny as it is scary, Lake Placid had a good cast and great effects. Another Croc film for the list is Rogue. An independent Aussie flick which didn't fare too well in the US box office but performed better globally and has very favourable reviews from most people. Another is Crocodile, released in 2000, this was actually directed by Tobe Hooper. Hooper shocked the world with Texas Chainsaw Massacre but fails in all attempts with Crocodile! The list of Crocodile films is very short but I think we get the idea with Lake Placid and Rogue. Snakes can also enter this category but like Crocodiles and Sharks, in very limited numbers. 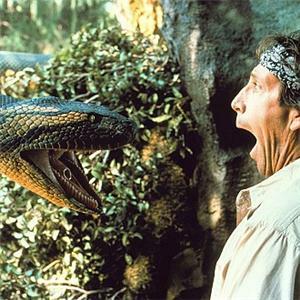 Anaconda, released in 1997 was a massive success and a film I very much enjoyed. Beyond this we have films like Copperhead, Python and Snake Island but one that really deserves mention is Snakes on a Plane. Starring Samuel L. Jackson. This film is beyond ridiculous but highly entertaining. Sharks, Crocs and Snakes. One thing they have in common, when they find a successful beginning, they milk it. Jaws spawned three sequels, Lake Placid has two with a third on the way and Anaconda has three! Jaws 2 being the only film of note from any of the franchise sequels. Before I end this article, I must write about a few of the worlds tiny creatures. While sharks and crocodiles look fierce and could eat you alive, there are another group of creatures which scare the world over, Spiders. Arachnophobia was released in 1990 and played on our fear of spiders brilliantly. Even now, when watching the film I find myself frantically itching my head and getting that tingly sensation. I know there's nothing to be scared of, its just an involuntary thing that we all do! Many other films have featured insects or small bugs but this one is a great example of how to do it the right way! I suppose I should wrap it up now. In conclusion, this genre covers a lot of different films from totally different places and as I mentioned in the beginning, far too much to write about without creating a large illustrated History of Film! One thing is for sure, while other sub-genres of the Horror pool may be scarier, Monsters serve the film world very well and give us endless hours of great escapism and lots of fun. Hey, really wanted to thank you for the articles on "Horror! Part 2: Fangs, Claws, Tentacles & Jaws! ".